Would you know how to read a Coca-Cola label or the similar labels on any other food product sold in America? Well, don’t feel bad, even I had had to look it up when the new labels were mandated in 1994[i]. Yes, picking on Coca-Cola by presenting two versions of the 20-ounce bottle label and our favorite whipping boy, the 12-ounce aluminum can, is an intentional act. 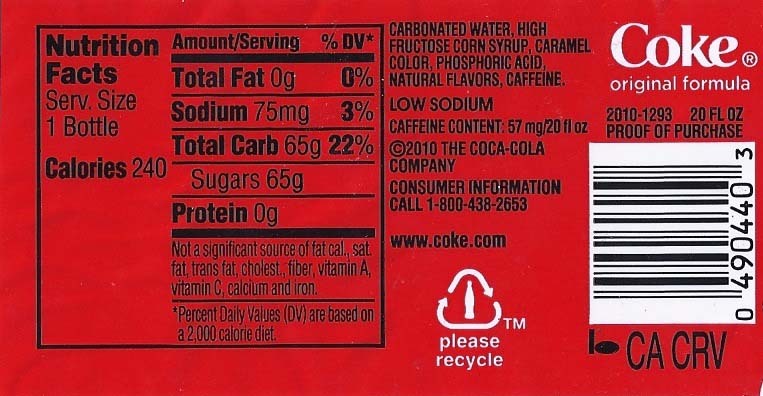 The reason: until very recently the Coke label defined the single most glaring technique for continued confusion of consumers: the section at the top of the main label box demonstrating the “official” Serving Size and Servings per Package sold to consumers. Before I hook that fish in a barrel, I’ll backtrack and briefly describe the label that Congress and FDA enacted for all food items sold in the United States. We start with two parts: the Nutrition Facts box and the Ingredient List (see Fig. A). 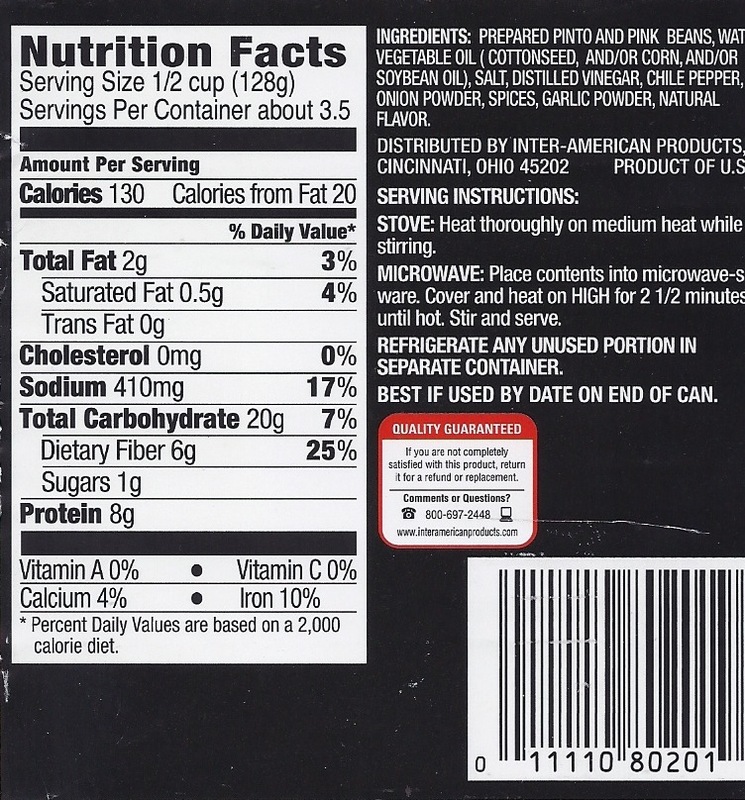 The Nutrition Facts box starts at the top separated from the rest of the data in the box by a thick printed bar that tells how many servings are in the package and what the recommended serving size is. Then the next section down lists Amount per Serving for Calories, Total Fat (sometimes with sub-headers for Saturated Fat, Trans Fat, etc. ), Sodium, Total Carbohydrates (with sub-headers for Sugars and Dietary Fiber) and lastly Protein. Interestingly enough, Calories and Sugars can be listed without referencing the Percentage of Daily Values (%DV), which is a percentage that measures how much is in the product versus how much various experts say you should have (for Sugar, Sodium, etc.) or how much you need (for Vitamins and Minerals) based on a 2,000-calorie/day diet. Typically, the lower half of the Nutrition Facts box is given over to nutrients like Vitamin C, Vitamin A, Iron and Calcium. Coke doesn’t have any of these nutrients and so the label reads not a significant source of Vitamin A, Vitamin C, Iron, Calcium or Dietary Fiber. The box at the very bottom of the box presents text that reminds the consumer that all calculations should be based on the 2,000-calorie diet, also defined by experts. The percentages in the lower section are given so the consumer can choose to eat more instead of limiting intake like with the ingredients listed on the upper part of the section. The Coke labels show an interesting progression from the very bad old days to almost normal days. The first 20-ounce bottle label (see Fig. B) shows two listings depending on how much Coke is consumed. The Standard Serving is 8-fluid ounces (240 mL) with 2.5 servings/bottle. The whole bottle (listed under This Package) is 20-fluid ounces (591 mL) and one serving. The similar label from a 20-ounce bottle bought at a gas station (tax deduction! See Fig. C) in the center picture only gives the same values for the whole bottle (original formula Coke is same regardless of the label). These distinctions become important when I assert that Coca-Cola used to game the labeling law to their advantage (pity that I couldn’t find an older 20-ounce label). The trick they pulled in the bad old days would be to only list the 8-ounce serving size nutrition information on the label. The 8-ounce serving size weighs in at 27 grams of sugar and the consumer might think I haven’t had too much sugar, today. I’ll buy a bottle. And promptly drink the whole bottle. 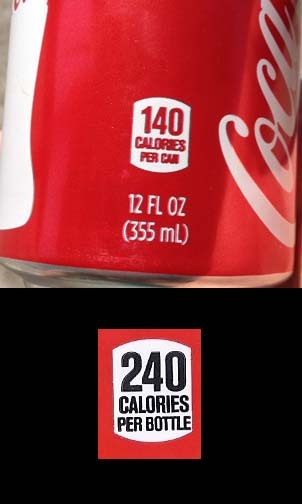 That the label posted on Coca-Cola’s website shows both and the label from an actual bottle only shows the listing for Serving Size (1 bottle) validates the efforts of many nutrition experts fighting to make the mandated label not be a pack of lies designed to trick shoppers into consuming more Coke. These trends also explain why the modern Coke labels on all packages also prominently displays in a large readable font the total calories – 240/20-ounce bottle and 140/12-ounce can. (See Fig. D) Enough people complained about the previous regime that tolerated such intentional confusion and Coke caved. Bravo! In a recent development (Feb. 27, 2014), the FDA and the Obama Administration have announced new labeling regulations that will make it harder for food manufacturers to pull off the Serving Size scam. Apparently, all three major networks carried the story with NBC using it as the lead on a night when portents of severe weather and a brewing international crisis should’ve dropped it to the back of the broadcast. The summary of the changes: an across the board reduction of the number of servings per container listed on the label and clearer labeling for added sugars (sugar added during production over and above sugar native to the raw food ingredients). This means that the generic 20-ounce soda bottle specifically mentioned in the NBC broadcast, as previously having 120 calories and 10 teaspoons of sugar per serving with two servings listed will now by law be relabeled to 240 calories and 20 teaspoons of sugar per 1 serving, the bottle. Hopefully, this more honest labeling will open more consumers’ eyes.Well, nothing can be done about Coca-Cola getting to claim that they voluntarily changed their labels ahead of the new regulation. The NBC broadcast also used a generic pint of ice cream, which was previously labeled as 4 servings, but will now list 2 servings. I’ve eaten full pints on bad days, but again it’s a start. NBC’s version of the story included reminders from diet experts about limiting added sugars by listing the big diseases: heart disease, diabetes and so forth as being caused by too much sugar in the diet. The report included the supermarket lobby saying they support any new labeling requirements that reflect actual science, possibly a stall tactic to see if their lobbyists can do anything about it. However, the end of the report included a tidbit about a major university including accurate labels in the cafeteria and seeing a 7-percent reduction in consumption of foods that might be harmful to students. Forward progress. But, do you know what a gram is relative to measuring units we actually use? Heck, I haven’t played with actual metric units since science class (a really long time ago). I couldn’t tell you what a gram of anything is, because I just don’t weigh or measure very many objects using metric units. But, I do know what a teaspoon is. We all do. Converting grams of sugar into teaspoons for the American audience is fraught with built-in possible errors starting with grams and teaspoons measure different things: mass v. volume. There is a conversion equation that I haven’t used since high school,so you’ll just have to trust me when I assert a conversion of approximately 4 or 5 grams of solid dry granular sugar to 1 teaspoon. Coke’s “Standard Serving” of 27 grams of sugar comes in at 5 or 6 teaspoons. The full bottle of 65 grams ends up choking us with 13 to 14 teaspoons. The 12-ounce can of Coke hits us with approximately 10 teaspoons of sugar. Teaspoons of refined sugar become important when we factor in the American Heart Association’s recommendation for daily sugar intake that as of 2009 are 9 teaspoons for men and 6 for women per day[ii]. One can of Coke will blow out our daily sugar limit such that if we were to take it seriously we couldn’t have dessert (if I’m going to take risks with my diet and it’s a choice between pie and a Coke, pie wins every time). I find it interesting that the American food manufacturer will only give the customer the metric measurement without the more accessible English units. We wouldn’t drink so much Coke if they spoke to us in teaspoons in addition to grams or milligrams. There is another dirty trick that makes use of the Ingredient List section of the food label. By law, ingredients have to be listed in descending order from most to least. Sometimes, a food maker will list several different types of sweeteners (sugar, corn syrup, maltose etc.) to disguise how much sugar is in the food. 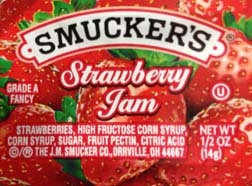 A good example lurking in the door of your refrigerator: the jar of strawberry jam. Everybody, whether a brand name or grocery store generic seems to have similar recipes for strawberry jam (See Fig. F and Fig. G) – in order: strawberries, high fructose corn syrup, corn syrup, sugar, fruit pectin and citric acid. Savvy people who read labels might be the only people aware that when three similar sweeteners are clumped together on a label that a very strong possibility exists that the collective amount of sweeteners could be greater than the strawberries in the jam recipe! Certainly, there is no taste difference between high fructose corn syrup, corn syrup and table sugar (sucrose). 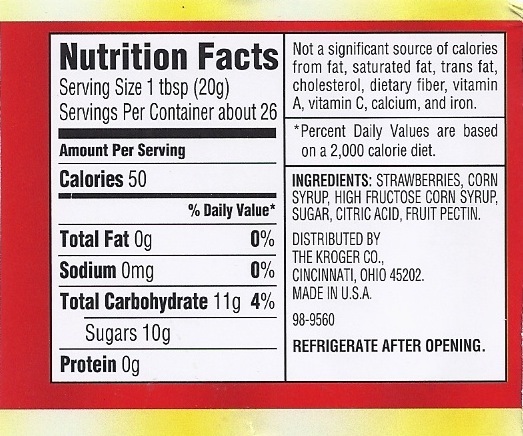 The generic label strawberry jam assumes 26 servings of a tablespoon each with 10 grams of sugar each. In this case, perhaps this is a mostly accurate usage of the Servings per Jar feature of the label (at least how I would make PBJs). But, jam and jelly comes in many different sizes, some of which are too small for a Nutrition Facts box, but must still list the ingredients (strawberries, high fructose corn syrup, corn syrup, sugar, fruit pectin and citric acid). The average consumer would suffer a head explosion trying to decipher how much sugar they ate in their restaurant pack at the diner by comparing the tiny pack to a jar of the same brand at the grocery store. In school, it’s called a proportional relationship (ouch!). The usage on the label of three sweeteners that all taste like sugar to disguise the amount in the recipe seems like a dirty trick that has been made easier by the up to now absence of a numerical value for added sugar. A food manufacturer only had to tell the shopper the total sugar in the jam, not how much came from the strawberries versus the added sweeteners. In the past, I would dare you to call up any food company and ask about added sugar; you’ll be told we don’t discuss our proprietary recipe in such detail. This may change with the new mandate for more clarity about added sugars on the label. We’ll see. In comparison, Coke’s ingredients are carbonated water, high fructose corn syrup, caramel color, phosphoric acid, natural flavors and caffeine. This simple recipe suggests that Coke, secure in being one of the world’s most recognizable trademarks and the assumption that their customers may not care about sugar intake, may feel less reason to lie about the sugar they sell. The consumer also needs to know what various nutritional claims mean. Does Sugar Free mean no added sugar at all or does it mean less than .5 grams of sugar? The FDA’s site[iii] and the American Heart Association[iv] say the latter. I encourage everyone to look up the regulations for sugar, fat and so on. Follow the links above or paste the footnotes into your browser. The label is good from the point of view that any label is better than none, but it seems like the FDA listened to too many food companies and created a system with just enough loopholes to get away with murder. We’ve covered the Serving Size and Number of Servings scam that may be fading into history because activists have finally spoken up loudly enough to be heard asserting that no one actually drinks an 8-ounce soda. The labels need more translation into understandable English units of measurement (teaspoons) and that the consumer should beware of similar classes of food being lumped together on the Ingredient List to disguise that it might be the most plentiful substance in the food. The label comes with a lot of fudge factor to it, but imagine no label at all. This is a good read! I’ve been trying now to read the labels before I put the food to my grocery cart but some of the labels are hard to understand…or is it just me? Anyway thanks for sharing!